All heat pump systems are more efficient than their electric heating system counterparts. Evaluating the merits of heat pump systems over less expensive electric heating systems requires objective comparison of how electric heating systems work and what level of electric energy costs can be expected. Most residential electric heaters are 5 KW, 7.5 KW, 10 KW, 12.5 KW or 15 KW, commercial and government buildings often use electric heaters sized to more than 20 KW. The size of the electric heater is proportional to the space it serves, the insulation and exposure level of the space to cold outdoor temperatures. Electric heater sizes in kilowatts are limited to the capabilities of the electrical service that serves it and the wire size and circuit breaker capacity of the branch circuit that powers it. 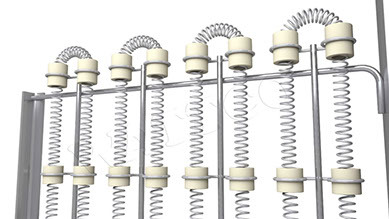 Residential electric heating elements of 10 KW or more are usually the largest circuit in the main electrical panel. Electric heaters of 10 KW or larger may have multiple circuits serving them and more than one circuit breaker in the panel. Most often, the electric heater is the largest electrical circuit and uses energy at a higher rate than any other appliance or system in residential homes. Utilities use KWH ( Kilowatt Hours ) as the basis for rates charged for energy to their customers. The cost of operating electric heaters is simple to calculate. The cost per KWH charged by the electric utility multiplied by the KW size of the heater determines its cost per hour of operation. For example if an electric utility charges 13 cents per KWH to power a 10 KW electric heater for a one hour duration ; the cost per hour of operation in heating mode is $1.30 per hour. If an 15 KW heater is used ; 15 KW x 13 cents x 1 hour = $1.95 per hour of operation. It is impossible to reduce heating energy costs by utilizing a smaller KW size for the electric elements because all electric heaters have the exact same cost per BTU of heat produced regardless of heater size. All electric heaters deliver 3.41 BTUs of heat per KW and it takes 1.08 BTU's per CFM ( cubic feet of air heated per minute ) of capacity for each degree Fahrenheit of air temperature heat rise produced by the heater. Larger KW heater sizes deliver the BTU’s to a given space more rapidly than smaller electric heaters and operate for shorter durations than smaller heaters but demand energy at a much higher rate. Smaller size electric heaters cost less per hour to operate but require more hours of operation to deliver the same amount of heating into the same space. Heat pump efficiency depends upon the type heat pump, but all of them are more efficient than electric heaters. Each heat pump system can be compared with an electric heating system of the same capacity by referencing its rated C.O.P. ( Coefficient of Performance ). The C.O.P. Of all electric heaters is a value of 1.0 and is based upon 3.4 BTU’s of heating capacity per KW and shared by all the various types, sizes and configurations of electric heaters. Heat pumps that have a C.O.P. of 4.0 or greater deliver 4 times more heating BTU’s than an electric heater of equivalent capacity for each KW of energy used. As an example, a 10 KW electric heater that costs $1.30 per hour of operation delivers the same amount of heating capacity as a heat pump system with an operating cost of 33 cents per hour or less. A 15 KW electric heater that costs $1.95 per hour to operate delivers the same amount of heating capacity as a heat pump using energy at a cost of less than 48 cents per hour of operation. 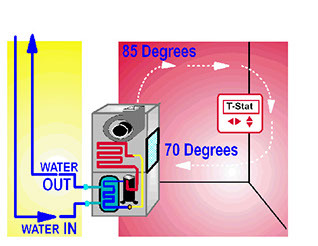 In both of these examples, the BTU’s of heat delivered to the space are the same and require the exact same amount of run-time to maintain the same indoor temperature at the users thermostat set point. During longer periods of cold weather the cost of using electric heating can be excessive. Heat pump heating systems provide efficient affordable heating comfort for our customers who use home heating whenever they need it for however long they need it. Most Johnson’s customers have the choice between a heat pump or use of electric heat. But some buildings that were originally designed with heat pump systems do not have electrical services, panels or circuits needed to replace the heat pump systems in the building with electric heaters. Where heat pump systems are already in place, retrofitting to electric heating will make the building less efficient and subject to increased electrical demand on the existing services, panels and circuits. Generally heat pump systems should not be replaced with electric heating systems with only very few exceptions. There are very few cases where an electric heating system cannot be upgraded when replaced to a heat pump system. All of our single family home owner customers have the option to upgrade from electric heat to a heat pump system. Most of Johnson’s multifamily unit owner customers can also select a heat pump upgrade. In all of those cases, the electrical demand on electrical panels and house wiring circuits and components is reduced to a fraction of the demand needed to serve electric heating and the cost of operation in heating mode is greatly reduced. Many of Johnson’s customers have ultra efficient heat pump systems that operate from cooling tower or geothermal water systems operated in their building, these are water source heat pump systems that are excellent for cooling and dehumidification uses and are heat pumps as a standard feature. 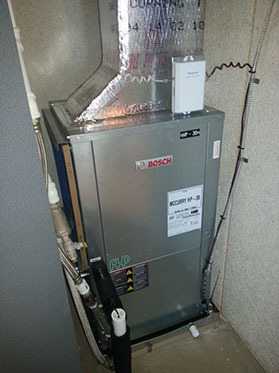 Many SW Florida multi family condominiums utilize water source heat pumps. Most water source heat pumps are used in commercial and government buildings or serving the multifamily residences in high rise condominiums. Johnson’s has decades of experience installing and servicing these systems. In addition to the heating mode efficiency advantages of water source heat pump systems, there are other significant advantage to the water source systems utilized in these buildings. They fewer dehumidification capability limitations than conventional air-to-air systems and can be much better equipped to control indoor relative humidity levels without having to operate at lower thermostat set-point to force operation for dehumidification of the conditioned air delivered into the space. Unlike dehumidifiers used in conjunction with air-to-air systems, water source heat pumps can be equipped with factory installed dehumidification packages that can provide continuous moisture removal without over cooling the space or needing a separate dehumidifier to supplement operation of the air conditioning system. Supplemental dehumidifiers heat the air the space while removing moisture from the indoor air ; it is normal for a stand-alone dehumidifier to heat indoor air to more than 90 degrees while removing moisture from the indoor air. Unlike air-to-air dehumidifiers, water source heat pumps equipped with factory installed dehumidification components and controls can continuously provide dehumidification and never heat the indoor air in the process. 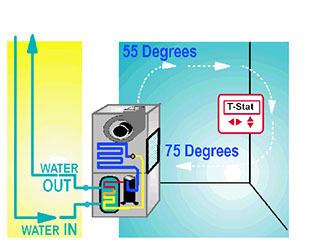 When a water source heat pump is equipped with central dehumidification controls, the discharge air temperature is not more than 70 degrees. When the system is in cooling mode the air delivered from the system is delivered into the space between 55 to 60 degrees until the users thermostat cooling temperature set-point is reached. If operating in cooling mode does not occur frequently enough, or for long enough durations to keep the indoor relative humidity level below the users set-point ; the system delivers 70 degree dry conditioned air into the space without over-cooling or over-heating the space. The water source heat pumps used in SW Florida Buildings are located where only subjected to conditioned air and not subject to harsh outdoor air conditions and corrosive environments that outdoor units are exposed to. Most buildings where water source heat pumps are used are engineered in such a manner that water source systems are the only type that can be used in the building. There are many factory options available but all of them are manufactured as heat pump systems as a standard feature.